Marie Enger looks like a vampire but isn’t. A friend to all cockatiels, an enemy to all fascists, you can find Enger skulking around the dark clutter of HEK studios in St. Louis and punk bars when there isn’t a deadline. It’s pronounced like “ANGER!” but with an E.
A jack of all trades, Enger’s work (story, art, colors, letters, book design) keeps showing up in books by BOOM! (Adventure Time, Rocko’s Modern Life), Dark Horse (Pistolwhip, 2 Sisters, Dept. H, TBA, TBA) , Oni Press (TBA, TBA, TBA), Image (Regression), Toonhound (Table Titans) and [SECRET TO BE REVEALED], on stage with bands like PUP and the Dollar Signs, on Adult Swim, and in international pop-culture galleries. When not working for someone else, Enger is self publishing the eldritch stoner comic Fhtagn and Loathing, along with the extremely bleak short horror collections We Are in a Dark Place and I Am Coming Home. Some people have described Enger’s art as the visual equivalent of licking a car battery. You can lick that art-battery over at so-engery.com and www.patreon.com/hek_studio and yell about it to @so_engery on twitter and instagram. Matt Miner is a New York Times featured comic book writer, pit bull rescuer, and aging punk living in Queens, NY with his wife and millions of dogs. Matt is well known for his politically charged and punk rock infused work including GWAR: Orgasmageddon for Dynamite Entertainment, Toe Tag Riot, Liberator, and Critical Hit for Black Mask Studios, and Poser for Waxwork Comics. Matt also co-edited/spearheaded the new political horror anthology This Nightmare Kills Fascists for A Wave Blue World and is working to bring to life a new anthology titled All We Ever Wanted: Stories of a Better World, that takes a look at a more positive future vision. Find his nonprofit dog rescue online at redemptionrescues.org, his comics site at mattminerxvx.com, and follow Matt on Twitter at @MattMinerXVX. Ray Nadine makes comics in St Louis with their cat, Nico. They’re into knives, crime, and fictional boys crying. If they ain’t working, they’re spending way too much time making curated playlists and watching way too much anime. They’ve been making webcomics since 2013, beginning with their self-published comic Dollhouse (dollhousecomic.com), and currently with Messenger (written by Paul Tobin, published by Webtoon). They’ve also made a handful of one-off comics and zines (Satellites, Anchored, Prick/Punch Drunk/Penalties, NSFW, Knives Out). Their work could be described as melodrama with a sensual stab in the back. Eric Palicki lives and writes in Seattle, Washington, and he’s not as angry as he looks. In addition to his self-published graphic novels ORPHANS, Red Angel Dragnet and Atlantis Wasn’t Built for Tourists, Eric has written for Darby Pop Publishing (Fake Empire), Marvel Comics (Guardians of Infinity), Black Mask Studios (No Angel, co-created with Eric’s sister, Adrianne) and Red Stylo Media (Baroque Pop). 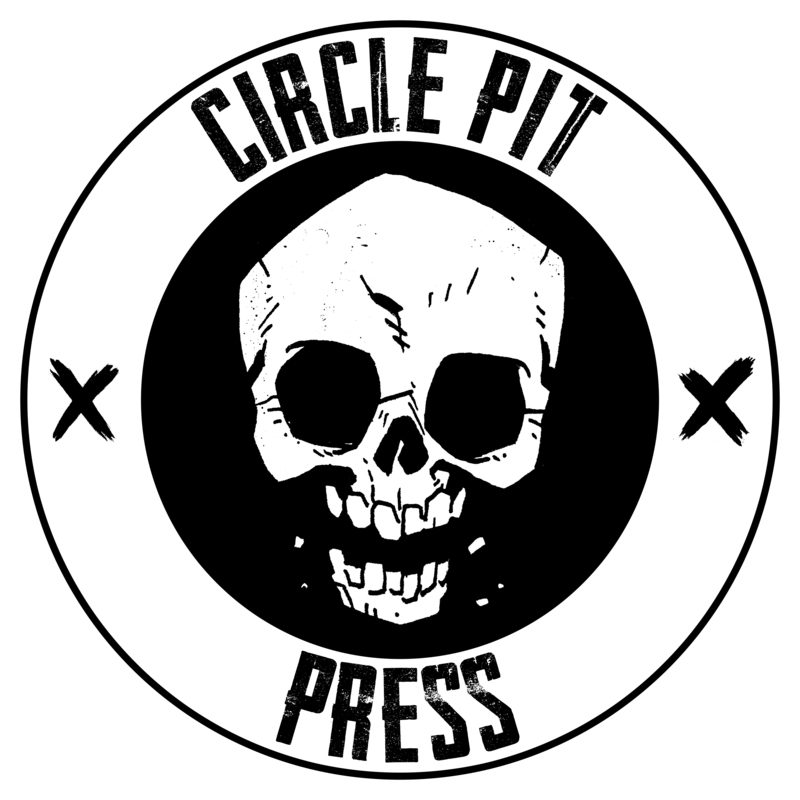 Alongside fellow Circle Pitter Matt Miner, Eric co-edited the anthologies This Nightmare Kills Fascists and All We Ever Wanted: Stories of a Better World, both published by A Wave Blue World. Eric’s upcoming projects include stories in The Death of The Horror Anthology, The Good Fight and the Terminal Anthology Series. Find him online at ericpalicki.com and @epalicki on Twitter. JB Roe is a Chicago-based artist and writer. He has been published by Hidden Fortress Press, Really Easy Press, Black Mask Studios, American Nature Comics, Image, and Comicker. He also co-owns Hardway (hardwayltd.com), a clothing brand. You can find him on Twitter & Instagram @mortcrimpjr. Jonathan Brandon Sawyer is an illustrator from Atlanta, GA. Jonathan’s comic credits include illustrating GWAR: Orgasmageddon for Dynamite Entertainment and Critical Hit for Black Mask Studios, as well as co-creating and illustrating the Boom! Studios series WE(L)COME BACK and Running Blood from Two-Headed Press. Outside of comics, Jonathan has also designed merch for bands such as GWAR, The Powder Room, Manray, Mind Powers, and others. Kelly Williams is a grumpy cave troll who occasionally comes out of hiding to skateboard and battle Alan Moore for “most epic beard in comics.” Kelly’s art is evocative and eerie, and radiates his deep love of horror and the bizarre. Find Kelly’s art in Eerie from Dark Horse Comics, A Letter to Jo from Top Shelf, the groundbreaking and astonishing Metaphase from Alterna Comics, Frolic, updated weekly on Cullen Bunn’s patreon, and various cover art from Teenage Mutant Ninja Turtles to Puppet Master, as well as anthologies such This Nightmare Kills Fascists from A Wave Blue World and his own horror series The Dark. Find Kelly online at treebeerdstuff.com and on Twitter at @treebeerd.